Despite thousands of objections and sustained local and national pressure, Third Energy have just been allowed to frack in Ryedale, North Yorkshire. Third Energy is owned by Barclays bank, which has invested in the company. Barclays is more sensitive to bad PR, so speaking out against Third Eye may lead to them losing financial support. You need not be in Ryedale to show support, since there are Barclays branches nearby. This Week of Action will take place from the 24th - 29th October. 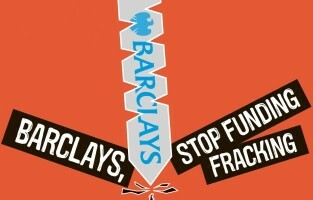 This is an opportunity to act in solidarity with Ryedale, and show Barclays, and other companies, that it cannot expect to get away with funding such a destructive industry, and challenge one of the major pillars of support for the fracking dream. Take Action! Click here to sign up for more information, and here for details on how you can get involved.